1. How do I open a JazzCash Mobile Account? Jazz and Warid customers can dial *786# or use Mobile App. Other network users can download the Mobile App to register. 2. Why do I need to submit CNIC pictures and live selfie for Mobile Account? This is a requirement by State Bank of Pakistan to open Mobile Accounts. Your data will be protected and will not be shared with any third party. How can I pay through JazzCash? Is there any fees to use the JazzCash Online Payment Option? There is no fees for you to use the JazzCash Online Payment Option. How can I pay through Voucher? 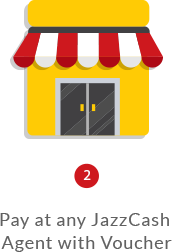 Customer will receive a system generated unique voucher number (12 digit) on his/her mobile number along with the expiry date. Where can I pay the vouchers generated through the JazzCash? You can pay the vouchers at any of the more than 65,000 JazzCash Agents, Jazz Point, Jazz Experience Centers or Mobilink Microfinance Bank Branches across Pakistan. How can I find my nearest retailer for voucher payment? You can find your nearest retailer for voucher payment using the below mentioned link http://www.jazzcash.com.pk/agent-locator/ You can also find your nearest retailer for voucher payment by sending “M” in an SMS to 2179 (for Mobilink customers only) or by calling our help line 111-124-444 (444 for Mobilink Customers). What amount should I pay to the retailer at the time of voucher payment? You will only pay the amount equivalent to the goods purchased. No extra amount to be paid to the retailer for using JazzCash services. How will I know that my voucher payment has been made? You will receive a confirmation message that your payment has been made against your order. How can I pay through Mobile Account? How do I register for JazzCash Mobile Account? How can I deposit funds in my Mobile Account? Once your Mobile Account registration is complete, you can deposit money free of cost from any JazzCash Agent. To locate your nearest JazzCash Agent, please write ‘M’ in an SMS and send it to 2179 (Mobilink Customers). In addition, if you already have a Bank account, you can transfer money instantly from your Bank Account by using funds transfer facility through Online Banking or ATM. All you need to do is select ‘Mobilink Microfinance Bank’ as the receiver Bank and use your Mobile number as the account number. Whether you deposit from a JazzCash Agent or through Bank, funds will be credited to your account instantly and you will receive a confirmation SMS from 8558. I have not received the MPIN request on my Mobile? MPIN popup will appear only if your mobile is unlocked. Please check again after unlocking your mobile or if the problem persists please dial 111-124-444 or (4444 for Mobilink Customers) for assistance. How can I pay through Credit/Debit card? Transaction will be processed and customer will be notified on his/her mobile number with the confirmation through SMS. What information will I have to share to make payment through credit/debit card? 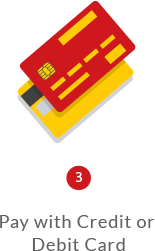 You will have to enter the card number, expiry date and the last three digits written at the back of the card. How can I get my credit/debit card activated for online purchase? You will have to call your respective bank for activation of your credit/debit card. Please refer to the Helpline for your respective bank mentioned on your credit / Debit cards. In case of any payment related query where should I register my complaint? 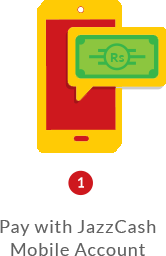 You can dial 111-124-444 or 4444 (For Mobilink Customers) for payment related queries. Can I pay through my Amex, JCB or Diners card? You can only pay through VISA, MasterCard debit or credit cards enabled for e-commerce transactions. My payment is declined while paying through credit or debit card? Please contact your issuing bank for further details. Do I receive any notification for my payment confirmation? You will receive a confirmation sms on your mobile regardless of any payment method.